Know that crunchy, buttery, cheesy goodness of a warm grilled cheese? 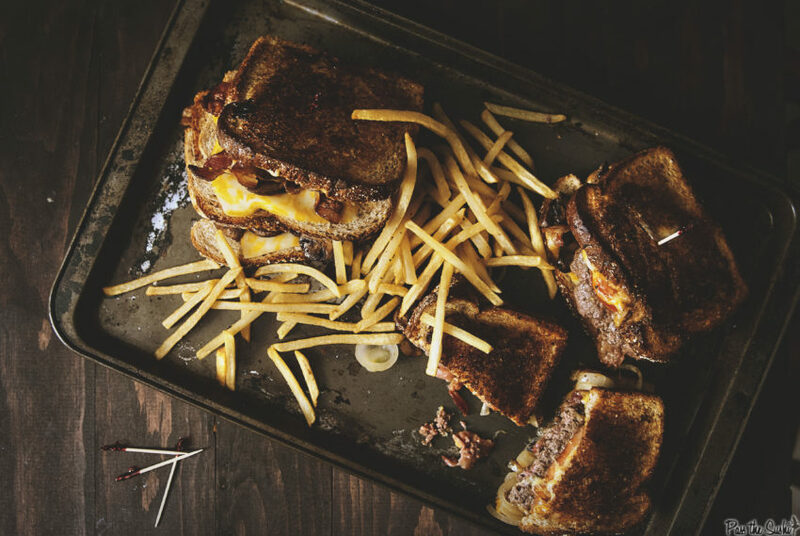 Well, this is a grilled cheese, burger, and loads of toppings combined to make your mouth water. Remember when mama would make you a grilled cheese sandwich, with the cheap government cheese? That stuff melts perfect. Now you’re a big kid, and forced to make your own grilled cheese sandwiches. It’s time to kick them up a notch and use those mature and aging taste buds while they are at their prime. 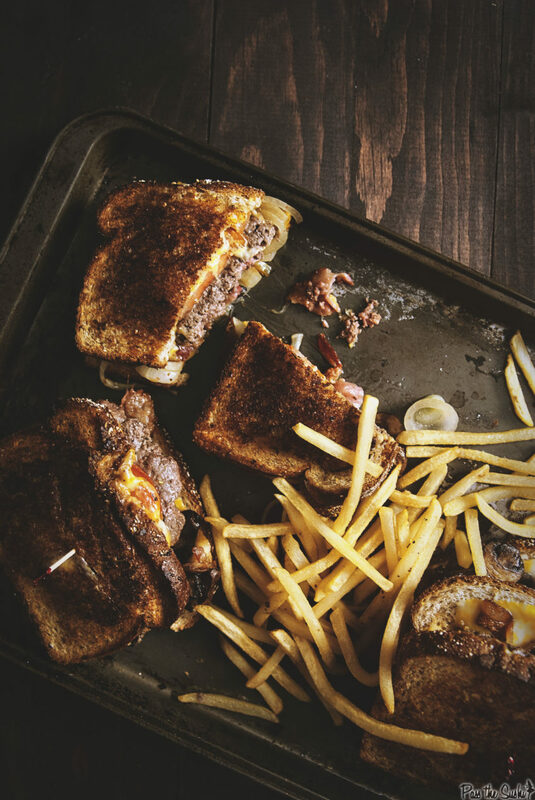 Grab some fixings, because this grilled cheese just got intense. PS. I’d grab a roll of paper towels while you’re at it. 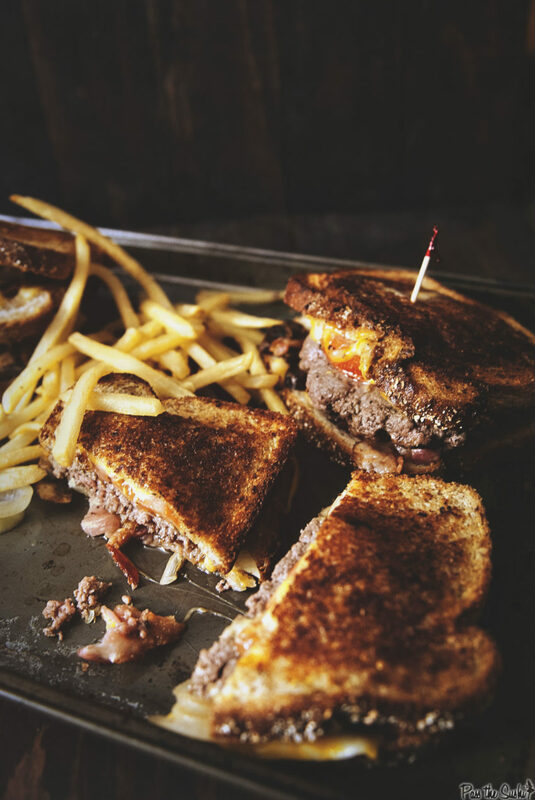 If you’ve tried my Grilled Cheese Burger recipe, or any other recipe on GirlCarnivore.com please don’t forget to rate the recipe and let me know where you found it in the comments below. I get inspired by your feedback and comments! You can also FOLLOW ME on Instagram @girlcarnivore as well as on Twitter and Facebook. For more burger madness, this is where you need to be! And if you are really feeling inspired, check out Burger Month every May. Yeah, it’s epic. Form the ground beef into wide flat thin patties. Season with salt and pepper and set aside. If using, preheat a large skillet. In a large skillet over medium heat, saute the onions and peppers with a pinch of salt, over medium heat until soft, about 5 to 7 minutes. Remove from pan, set aside. Salt the patties. Swirl 1 tbs butter in the pan to coat. Add the patties and cook 3 to 5 minutes, flipping once halfway through cook time. Remove from pan. If using the skillet, wipe down. Butter the outside of each slice of bread. Lay a slice of cheese on each piece of bread. Add a patty, top with onion and pepper mix, a slice of tomato, 2 slices of bacon, and another slice of cheese. Add the top piece of bread, butter side out. Place sandwiches on pre-heated griddle or hot skillet. Cook until golden brown and cheese is melted through, flipping once as needed to brown both sides. Um….I love you. That’s all. Ahhhh be still my heart! I have been wanting to make grilled cheese burgers for so long. This speaks to my soul. Yep. I said it. Holy mother of grilled cheese, come to mama. II need this in my life. I’m just sitting here trying to decide what I want to it. Score, found it. Your freaking photos just slay me every time I visit Kita. You have so much talent. I cannot master the moody shot and I love those types of photos. Fabulous. I have everything I need to make this, it’s dinner time and I’m drooling. Guess what that means. Can I come live with you for awhile. I just want to learn how to take pictures like you! Whoa, I could plow into this amazing sandwich! That gooey cheese and juicy burger make an irresistible combo. 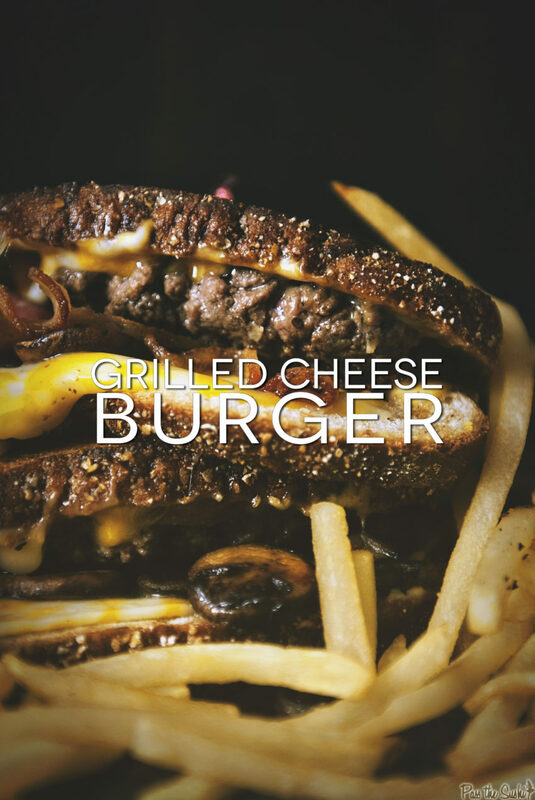 I’ve always wanted to try a grilled cheese burger. 🙂 For some reason I have always loved that fakey cheese. I can’t really eat it though so I am really bummed. I’ll have to make this with grown-up cheese! DAAAAAYUM! Seriously?! This would be dangerous around here. I’d never stop eating ’em!